We are able to deliver high quality Coil Winding Machines like like automatic coil winding machines, CO2 mig winding machine, transformer testing equipment, automatic coil winding machines. 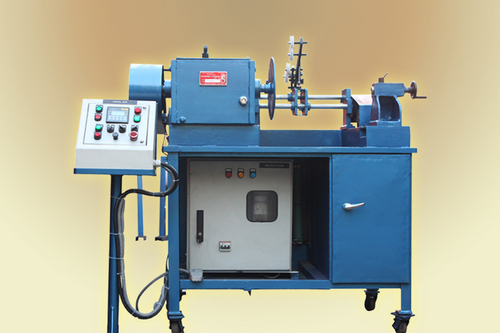 We offer a varied range ofReeling Machine, Paper Covering Machine for Wire/Strip, Type-Vertical, Light, Medium & Heavy L.T. Coil Winding Machine and Board Cutting Machine. In addition, we also offer Automatic Coil Winding Machine for Wire and Automatic Layer Coil Winding Machine. Our range can be customized according to the needs of our clients belonging to electricity, transformers, gear and welding industries. Machines offered by us have made an impact due to their features like optimum performance, easy operation, low maintenance, easy installation and reliability. Our strong commitment towards quality and timeliness has made us a renowned name in the industry. We are working with numerous private and government sector organizations. Some of our clients are SAIL Power Gears Ltd, EMCO Ltd & Voltamp Electricals. We are also working with electricity boards of states like Orissa, Meghalaya, UP, Bihar and Jharkhand. Our range is also appreciated by numerous companies from Bangladesh, Libya and other countries.